Finding the right motorhome accessories to fit your motorhome, is all about recommendations. It appears, that 9 times out of 10 people fit things, on recommendation. In fact, when you set out to retrofit something, it is not always about how easy it is to fit. Therefore, listening to what customers want is very important. So, here at Derby motorhomes we believe in testing products. We fit both motorhome and camper accessories. Therefore, it really is all about using them and listening to what our customers think. Especially, in the conditions that they were meant to be used in. However, all that being said, listening to what the accessories have been like to use, is just as important. In fact, we tend to use brand leaders. Especially, products, that work well on Auto-Sleeper motorhomes. The fact remains that some motorhome accessories are bespoke. There are thousands of leisure related products, both online and offline. 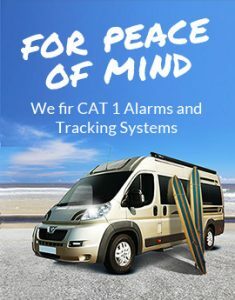 Motorhome and campervan owners consume good products, like alarm systems where CAT 1 alarms, are the order of the day. Along with popular tracking systems and specialist tracking devices. All helping to keep those motorhome insurance premiums down. Mobile technology has driven media products to new heights. Many new motorhomes now have media packs fitted from new. These are available to retrofit onto second hand motorhomes. Good communications, in media packs, especially when you are out and about, are a must have motorhome accessory. With sat navigation being so useful, when you need to find that remote stopover they come in handy. Also, it is worth noting that if you use a top branding tracking system, then your insurance premium may well come down. Always remember to mention when your policy is due, that you have had your alarm and tracking system fitted by professionals. Entertainment and media packs have become really popular. Here we like to provide as much information on media packs and entertainment accessories. 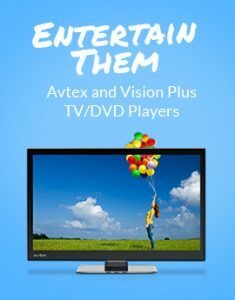 We fit leading accessory from Avtex , like the vision plus TV and Video players. Better cab entertainment with DVD players and digital radios, proving to be an upgrade solution. Motorhome accessories are big business, we see why. None more so than having the right media packs. Just like home entertainment, having a good TV on those rainy days is god send. Also, keeping those children entertained and not missing your soap program, are all on the list of good entertainment packages. Better media systems and winter protection, are all driving motorhome accessories on. There is nothing better, than having a good media pack in place. Ask us for more details, on USB sockets and Bluetooth equipment, some of which are standard equipment on an Auto-Sleeper motorhome. When it comes down to motorhome cleaning products, it goes beyond just a good wax polish. Specialist treatments and body protection. all are really popular products. Also, keeping your motorhome clean, both on the outside is a challenge and keeping it clean on the inside is another matter. Professional Paintseal services, we are able to arrange for your motorhome to be done professionally, with the Paintseal body protection. In fact, nowadays people look to protect their motorhome by having a specialist treatment done when brand new. However, the second hand motorhome will look a million dollars with a Paintseal treatment. Thus, they tend to last very well and you can protect outside and inside as well. So, when the red wine is on the sofa, just wipe it with a clean cloth and job done. This now is a very popular treatment, to have applied to your motorhome. 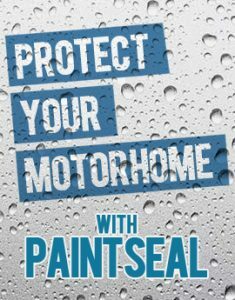 We have Paintseal treatments available that can be carried out here in Derby or at your home address. Paintseal has a very good reputation and they even treat aircraft and boats. Safety products like improved colour reversing cameras, even high visibility jackets and warning triangles. All types of safety warning accessories are available. When it comes down to gas and electricity, then the first thing is safety. There are some good warning accessories, to ensure your safety, when using your motorhome. From smoke and carbon monoxide detectors, to safety cut off gas supplies, we are able to help. Now they do wear out, so, checking the tread wear is important. Also, when was the last time you took a look at your spare tyre? In, fact, when your motorhome is in storage, especially, for a long time, tyres can develop flat spots. Also, when did you last check those pressures? Many new motorhomes, have a the simple device of a tyre pressure warning device. In addition, a good get you home spare kit, is well worth investing in. Getting up on that roof to clean it, may need that ladder attachment after all. However, a professional valet now and then, will also keep your motorhome in tip top condition. We provide a full professional valeting service and can help clean those difficult places. To look at the other side of the motorhome accessories coin, then think replacements batteries and extra leisure batteries. So, with split charging and better batteries, being powered by solar panels. All solar panels fit neatly on the motorhome roof. So, letting the sun do the work, has to be a good idea. Many motorhomes have two leisure batteries, from new. However, having a good battery is important as motorhomes are large vehicles to push. A good set of heavy duty jump leads is always worth having for that quick start. We use Hankook batteries for both leisure and normal batteries. If you have a charging issues, let us know and we will advise you of what to do. The demand is out there and good motorhome accessories, as well as the practical ones, many do add value to your motorhome. Value in some cases that they make life more easy to use. Therefore, improving the residual value, when it comes down to sell your motorhome. With a good set of motorhome accessories fitted, your specification is going to be really excellent. An extra leisure battery will come in handy to give things a boost. Happy to help you +44 (0) 1332 360222. Over the past few years we have worked hard to make sure that we supply a quality product and more importantly an after sales service for those products, should the need arise, that we consider gives our customers peace of mind when making an investment in any accessory. Don’t forget if you an ASOC member you will receive a 10% discount off prices of our accessories. Please note; a valid in date membership card is required before work starts. So, just get in touch with our after sales staff, they will be more than helpful. We fit most motorhome accessories and can help recommend what and why we use the makes and brands.